Dystopian, yes. Unimaginable, no. In fact, a version of our present moment was imagined more than eight decades ago by novelist Sinclair Lewis who wrote a still readable (if now fictionally clunky) novel, It Can’t Happen Here. Its focus: the election as president of a man we might today call a right-wing “populist,” but who, in the context of the 1930s, was simply an American fascist. Lewis gave him the fabulous name Berzelius “Buzz” Windrip and, unlike our president of the moment, he wasn’t a billionaire from New York but a politician from the Midwest. Exhibitionist boasting? Sound faintly familiar? Or take this passage about a U.S. Army major general who leads a militaristic show of support for Windrip at the political convention that nominates him: “Not in all the memory of the older reporters had a soldier on active service ever appeared as a public political agitator.” Though Michael Flynn (the “lock her up” guy) was a retired lieutenant general when he strutted his stuff at the 2016 Republican convention, doesn’t it sound uncannily familiar? Or to pick another example, at one point in Windrip’s ever more authoritarian presidency, the book’s protagonist, journalist Doremus Jessup, has these thoughts, which have a distinctly Trumpian feel to them: “He simply did not believe that this comic tyranny could endure. It can’t happen here, said even Doremus — even now.” Admittedly, the ability to tweet was still 70 years away, but comic nightmare, dystopian revelry, a nation slipping further into a militarized state of autocracy? Can We Stop Feeling Quite So Helpless and Hopeless in a World on the Skids? In the wake of Donald Trump’s inauguration, George Orwell’s 1984 soared onto bestseller lists, as did Sinclair Lewis’s It Can’t Happen Here and Margaret Atwood’s The Handmaid’s Tale, which also hit TV screens in a storm of publicity. Zombies, fascists, and predators of every sort are now stalking the American imagination in ever-greater numbers and no wonder, given that guy in the Oval Office. Certainly, 2017 is already offering up a bumper crop of dystopian possibilities and we’ve only reached July. But let me admit one thing: the grim national mood and the dark clouds crowding our skies have actually nudged me in a remarkably positive direction. Surprise of all surprises, Donald Trump is making the corn grow in Connecticut! My kids and I planted corn seeds in a square bed in our front yard this spring. Really, they just dumped the kernels in the ground and stared expectantly, waiting for them to grow. Three hundred corn plants seemed to germinate overnight, crowding each other out as they worked to reach the sun. I’ve been steadily thinning the clumps into rows and now we have a neat line of a dozen or so corn plants, each just about three feet high, along with lettuce, kale, collards, peas, basil, and a few tomato plants in a four foot by four foot raised bed. The kids — Madeline, three, and Seamus, four — visit “their” corn plants, name them, argue over whose are whose, and generally delight in their bona fides as Connecticut corn growers. It’s all part of a (somewhat incoherent) plan of mine that’s turned most of our front yard over to vegetables this year, including more tomatoes sprouting beside that raised bed along with plenty of cilantro. We have a fig tree, too, and apple trees, blueberry bushes, even a Shinto plum in back of the house along with a little potato patch and more herbs of various sorts. It’s a fertile little urban oasis. For water supplies, I went as far as to install rain barrels at our downspouts, which tend to quickly fill to the brim whenever we get a half-decent rain and then cause moisture problems in the basement as water begins to gush out of their mosquito-proof tops. I worry about those barrels whenever I go away, but also feel a strange pride when I water my vegetable patches from them instead of the hose. If I stop to think about it, however, they drive home the point even better than a haphazard row of jaunty corn: I have no idea what I’m doing. That’s not the end of the world, though, is it? This spring, as the political scene turned from truly bad to criminally bad, I began to see how not knowing what you’re doing could be a legitimate path, if not to power, then to resistance — and therapeutic as well. Seriously, it was therapeutic to dig and plant, weed and water. It was healing to do that with my kids, to hear them teaching each other about a world of growing things, to watch them go from grossed out to awed by worms and beetles, to see them bend their noses almost to the earth to follow the wiggly movements of such creatures. We’re now picking peas from plants that grew from seeds Seamus planted in little cups at the end of his school year. Every time we come home, he says, “Daddy, look at how tall my peas are!” and he runs over to trace their curly tendrils as they climb the twines we tied. Sometimes, when the dystopian possibilities of our world sink in, I think about the importance of self-sufficiency. Still, to be perfectly honest, given the costs of the rain barrels and the lumber for those raised beds, given my time and effort and ignorance, we may be growing some of the world’s most expensive peas, tomatoes, and kale. And it’s not like we have to wait for the kids’ corn to grow (and cure) to make popcorn. We do, however, make a lot of our own food. We bake sourdough bread from a pungent starter kept in the fridge. We ferment our own yogurt and stir up batches of granola every few weeks. It’s fun. It’s work our whole family gets into. It helps teach our kids what real food tastes like — that yogurt doesn’t come naturally in a plastic tub loaded with sugar and fruit on the bottom; that bread can emerge from the oven hot and chewy and is best eaten at that moment slathered in butter. Like all but a microscopic number of Americans, however, no matter how we toil in our spare time, most of our food doesn’t come from anywhere nearby, thanks to the wonders of the global transportation system and the work of exploited laborers in distant fields and orchards. My kids eat berries all year round, not just in those wondrous brief windows when our little strawberry patch produces and our blueberry bushes bend with their weight of blue orbs. The pecans for our granola are a product of the U.S.A. — so says the bag without specifying where exactly the trees grew in these 50 nifty states of ours — and are certified kosher. The flour for our bread holds the same secrets. Where did that wheat grow? We live in New London, Connecticut, a small city in a small state. Throughout the summer months, you can go full bore locavore and feed your family Connecticut-grown milk, eggs, fruit, vegetables, beef, and pork, serve local wine, and all sorts of locally caught or raised seafood. No bananas or chocolate or coffee of course, but the bounty of our state has inspired food producers, professors, and policy people to promote New England as a “food shed” potentially capable of growing, processing, and distributing enough stuff to essentially feed itself. It’s a goal of such types to locally produce 50% of all food distributed within New England by 2060, thanks to programs to promote the retention of family farmland, an expansion of urban gardening, and a generational effort at education. Right now, however, 90% of our food is grown outside both the state and New England. You might be wondering at this point whether such an agrarian vision isn’t both utopian and utterly retro. After all, why worry about locally grown food when we can Fresh Direct asparagus in November? Over-the-top paranoid? Maybe. But it rang a bell of worry with me. Yes, the planet is changing radically and an erratic and vengeful man in the Oval Office eggs it on. Donald Trump now being the boss of the largest nuclear arsenal on the planet puts a new spin on the phrase “You’re fired!” So, the thought that we might be left to fend for ourselves in New London seems less than paranoid these days — but of course maybe I’m just paranoid! History shows that empires fall, that money can suddenly lose its value (think of the Weimar Republic just before the rise of Adolf Hitler), that promises can be broken, and treaties trampled, that rain can suddenly stop falling, and madmen can consolidate power, and it may someday show that martial law can be declared by tweet. Who, in fact, knows what can happen on our extreme planet, which means that we need to learn how to do things, make things, grow things, fix things ourselves instead of assuming that others will continue to do all of it for us. I need to learn how. My kids need to learn how. Enough at least to do our best to take care of ourselves and our neighbors. Write all of this off as my overactive imagination, if you wish — fed by works like Octavia Butler’s Parable of the Sower or Cormac McCarthy’s The Road — but my own lack of self-sufficiency has been on my mind for a while. And on that score, I do have cause for alarm. With luck we won’t have to fend off the zombies or defend our turf from some future well-armed local militia, but as of now we can barely protect our blueberries from the birds or our lettuce from the grubs. My front-yard garden is modest and haphazard at best, but working on it does make me notice and admire the other front-yard gardeners in my neighborhood. A woman up the street has an amazingly impressive crop of tomatoes and string beans coming in. Two streets over, someone built hoop houses in their front yard and grew greens of various sorts all winter long. When I pluck my own kale leaves and feel connected to the larger urban farming community, all of us eating something out of our own yards, I’m sometimes reminded of the Victory Gardens of the World War II era. Back then as a practical response to war-induced scarcities and to a massive and sophisticated propaganda campaign, Americans dug up their lawns in staggering numbers and put in gardens, turning the clock back briefly on rapidly suburbanizing communities and industrializing lives. For a few years, neighborhood farmers genuinely helped feed America. Victory Gardens have their spot in the history of the home front in World War II, but I was surprised to learn recently that they actually date back to the First World War. In 1917 and 1918, Americans planted eight million gardens, producing food worth $875 million. In that era of war against Germany, those homefront farmers even renamed sauerkraut “liberty cabbage.” Embedded in the propaganda of the time, however, was an early recognition that Americans had lost something real in the concrete jungles of the country’s cities and that it was still possible to reestablish a connection to the land and be producers again, no matter where you lived. When World War I ended, however, most Victory Gardeners put down their hoes and went back to buying food, not growing it — until, that is, 12 days after the attack on Pearl Harbor in December 1941, when the National Defense Gardening Conference revived the idea and everyone got back to work. In those war years, many farmers were drafted and food and fuel were rationed. Meanwhile, the War Department’s propaganda machine launched a brilliant campaign to promote “Victory Gardens” to grow food for family consumption and canning for the winter months. A poster of that time caught the mood of the moment perfectly: a suburban housewife, her arms full of lidded glass jars, her eyes wide with excitement or exasperation (or both), exclaims, “Of course I can! I’m patriotic as can be — and the ration points won’t worry me.” Victory Gardens enlisted women, children, the elderly, and the infirm in the war effort. Everyone had a role. In 1943, 20 million gardens produced 8 million tons of food; more than 40% of all the vegetables consumed in the nation. That remains a phenomenal feat and it wasn’t just restricted to front and backyards. The city fathers of San Francisco turned over the lawn at City Hall to local farmers; the Boston Commons was quilted with gardens; and public land nationwide was hoed and rowed and made to produce. Now, I dislike rank propaganda as much as the next person, but face it, Victory Gardens were cool! And the posters appeal to so many traits we think of as inherently American: can-do-it-ness, self-sufficiency, hard work. 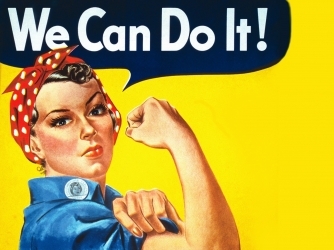 In those years, Rosie the Riveter was joined by Wendy the Weeder and Peggy the Planter and, miracle of all miracles, those Victory Gardens helped feed America just as they had in the previous world war. Not too long ago and a million years before the advent of the Internet, we did that. It’s possible again. In the age of Trump, however, it’s so much easier to focus on what we can’t do and on what disastrous harm is being done to us and the country. We can’t build bridges, or get out of any of our wars, or scrub the insides of industry smokestacks, or even think about stopping those global waters from rising. But, if we put our minds (and hands) to it, we can still grow food, block by block, yard by yard, and feel a hell of a lot less dystopian in the bargain. What would it be like to be mobilized by my government — and I emphasize “my” because as far as I’m concerned, Donald Trump’s version of it doesn’t qualify — into some collective effort to make this country a better place. When we entered World War II, the United States rushed onto a war footing and, disastrously enough, in many ways it’s never gotten off it again — except when it comes to the public. We Americans were demobilized long ago when it comes to war, even as military spending headed for the heavens (or for hell on Earth) and the national security state became the defining branch of government. We, who are eternally to be kept “safe” by that militarized state are also eternally not to raise a hand when it comes either to the war “effort” or much else. No Victory (or in this era, possibly, Defeat) Gardens for us. Few of course could even name all the countries in which the U.S. military is at war these days, no less list the strategic or political goals behind our trillion-dollar conflicts. Many of us don’t know any active duty service members in our now “all-volunteer” military. Our eyes tend to glaze over when we stumble on a war news story. All our government has wanted from us in its war effort (and this has been totally bipartisan) is our complacency, our inattention, our distracted and ill-informed consent or at least passivity. In exchange, our leaders regularly suggest to us that there’s no need for sacrifice or scarcity or hardship on our part. We are, that is, to be prepared for nothing. President Trump has put a new twist on this American compact. He’s ready to mobilize us, but only to render him our loyalty (whatever that may mean) and adoration. Giving him such loyalty these days is a growing white supremacy movement emboldened to emerge from the shadows and into the streets with its hate and violence on display. The Trump presidency has certainly provoked disdain, disgust, mistrust, resistance, and protest — but so far, not sustained, alternative, creative activity, the sort of things that would support this country literally and figuratively over the true long haul. Still, Victory Gardens are alive and well, at least in Milwaukee. There, the Victory Garden Initiative will come to your house (if you ask them and pay them) and install garden beds in your yard. In the Bay Area, a “gardener on a tricycle” will deliver your Victory Garden starter kit and build garden beds for you out of untreated redwood. For those thinking about sustainability in tough times, you can find a dozen books that contemplate the concept. I must admit that I haven’t yet gotten into the habit of calling our front yard a Victory Garden, but it is at least vibrant and vital. It already sustains me (and Madeline and Seamus) in tough times, even if it will be months before we can actually eat the few ears of corn our little patch produces, if the birds and bugs don’t feast on them first. The kids want to have a corn party with our neighbors. It’s an idea that fills me with satisfaction, even if those ears won’t nourish us for more than a few minutes. Still, our fleeting (and delicious) ability to feed one another might help us grow a bigger patch next year and face with a greater sense of self-assurance whatever zombies Washington sends our way.